Whether you’re looking for hotels to reserve for one night or a few months, Little Suites Provo has what you need to enjoy a comfortable stay. Located in Provo, UT, our hotel is near restaurants, BYU and UVU, shopping centers, the mall, and I-15. Our hotel suites are larger than average, so you have plenty of room for luggage as well as any other belongings you need to bring with you. We offer two room sizes, both of which are outfitted with full kitchenettes, including a refrigerator, stove, microwave, and utensils. The first room type has one king-size bed and is suitable for two adults or a parent and a child. The second room type has two queen-size beds and fits a family of four comfortably. All of our rooms are non-smoking. You can see a complete list of the amenities each room offers by clicking on the Rooms tab. In addition to the amenities listed, your reservation also comes with free parking anywhere in our large lot. 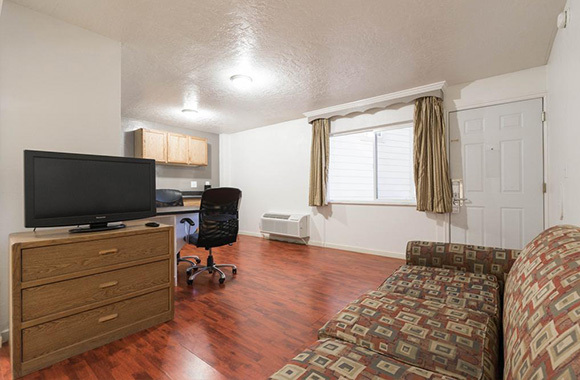 When you need a place to stay for a while, Little Suites Provo is a nice place to come home to. We regularly host guests who are between homes, traveling for work, or in need of temporary housing for any other reason. To help make your stay even more affordable, we offer discounts on extended reservations. You can choose between our weekly and monthly rates. If you have a promo code, simply enter it when you reserve your room. At Little Suites Provo, you get more room for your money. 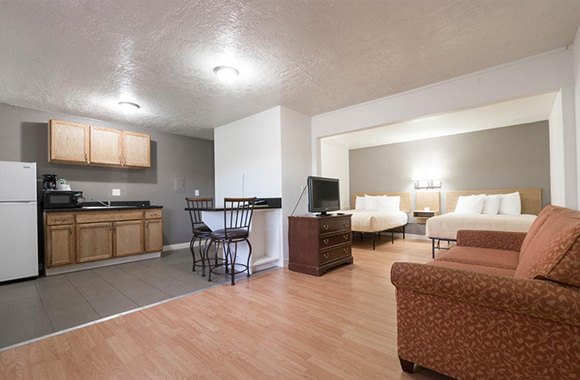 If you’re ready to reserve one of our spacious hotel suites in Provo, UT, you can check availability online or call 801-374-6800 to speak to our friendly hotel manager. Book now and take advantage of our affordable rates!